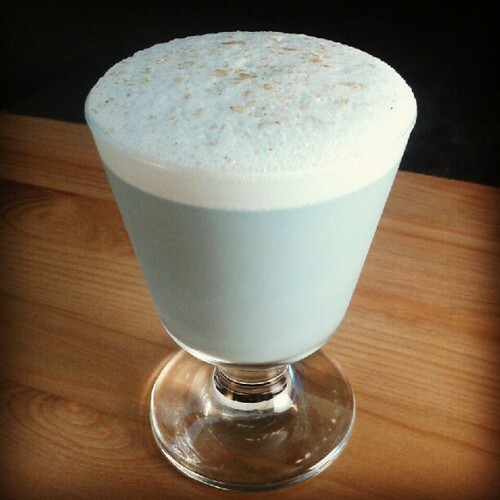 Blue drinks have long been a mixologists’ in-joke. When bartenders were getting serious about pre-Prohibition cocktails about five years ago, jet-setting New Zealand bartender Jacob Briars invented the Corpse Reviver Number Blue, a piss-take on the sacrosanct classic Corpse Reviver #2 that was enjoying a major comeback. Since then, he and other bartenders have been practicing “sabluetage”—spiking the drinks of unwitting victims with blue curaçao when no one is looking. The forbidden liqueur can now be found on the menus of a few of the world’s best cocktail bars, including Jasper’s Corner Tap in San Francisco, PDT in New York City (where it’s mixed with other unfashionable ingredients, such as Frangelico and cream), and London’s Artesian Bar (winner of the World’s Best Hotel Bar award this week), where a new blue drink—called Blue Lagoon—also features Sprite and bubble tea. Vaccari Nero is a black sambuca that’s part of the Bols portfolio. I didn’t work with it for a long time because it wasn’t available in Oregon, but on road trips to other states I found that it had the potential to become an enthusiastically embraced spirit. This is in part because it’s a quality sambuca: It’s named after Arturo Vaccari, the creator of Galliano, and gets its extracts and distillates from the same source. It’s also in part due to its rich color, which despite its name is not black, but rather a very deep midnight blue. Mixed in cocktails, it adds a strong anise kick and striking hue. Add the sambuca, lemon, genever, simple syrup, cream, and egg white to a shaker. Dry shake to aerate, then add ice and shake again. Give it a good, long, hard shake. Strain into a glass, preferably a champagne flute if you have a tall one. Let the foam settle and top with soda. Finish by grating a bit of coffee bean on top, a nod to the traditional “con mosca” way of serving sambuca. Vaccari Nero is finally available in Oregon, so I’m looking forward to seeing what local bartenders end up doing with it. To kick things off, I’ll be guest bartending at Portland’s new Italian spot Bar alla Bomba this Thursday, November 29, from 7-10 pm with a menu of cocktails featuring Vaccari Nero, Galliano L’Autentico, and Galliano Ristretto, including the drink above. Come on by to try it out. Last night in Portland, I was guest-bartending for Bols at an event at Vault where we were challenged to come up cocktails inspired by the classic drinks of New Orleans. When I think of New Orleans drinks, three types come to mind. First are the spirit-driven classics like the Sazerac and Vieux Carré. Then there are the giant, sweet, fruity drinks for the tourists on Bourbon Street. 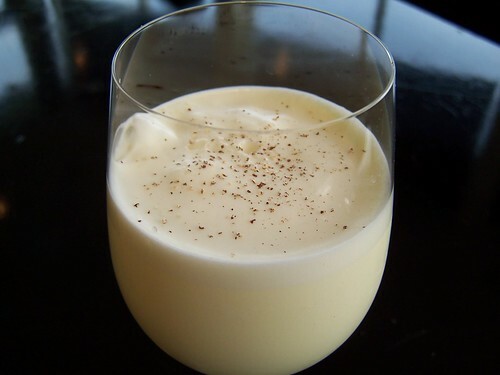 And finally there are the creamy, frothy brunch drinks like Ramos Gin Fizz or the Brandy Milk Punch. Give the first four ingredients a long, hard shake with ice, then strain into a wine glass. Add a splash of soda and grate some fresh nutmeg on top. With an ounce and a half each of Galliano and cream there’s no getting around that this is a sweet drink, but it could be just the thing for a hair of the dog brunch after tonight’s Mardi Gras festivities. Unless you’re giving up drinking for Lent, but let’s be honest: No one reading this blog is likely to do something drastic like that. Any drink using a dairy product is fair game: milk, cream, eggs, butter, cheese, yogurt, curds, you name it. Given the importance of dairy products in drinks dating back centuries, there are lots of opportunities for digging through vintage receipts for a taste of the past, and as always innovation is highly encouraged. Not everyone is in to dairy drinks. Me, I love ’em. I’d drink straight heavy whipping cream if it weren’t so unhealthy. I’ve written frequently about raw milk. The Golden Cadillac is a guilty pleasure. That said, I don’t order milk-based drinks often and generally save them for the occasional dessert libation. Combine the first five ingredients, shake over ice, and strain into a shot glass. Float wet whipping cream then finish by grating fresh cinnamon on top. It’s an indulgent drink, but it packs enough heat to balance the sweetness. And now that I’ve published it I really need to get around to finally watching The Big Lebowski. *Grain alcohol infused with cardamom seeds. 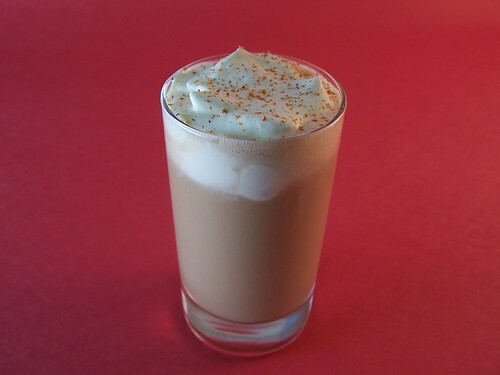 **The cream should be whipped just enough to float yet still be liquid enough to drink; the cream in the photo is actually a little too stiff. To make this on the fly pour cream in a cocktail shaker with the spring from a Hawthorne strainer and shake for 10 seconds.